C.R. Onsrud’s Qube series of CNC machines offers a large, fully enclosed work envelope along with chip collection and five-axis machining capabilities. The series is suitable for nonferrous metal, composites, plastic and wood applications. It offers accurate and fast machining of components for the aerospace, automotive, and tool and die industries. The work envelop measures 5 × 12 ft. with a 41″ Z-axis clearance. A 12- to 15-hp spindle and a FANUC 31i control provide flexibility, containment and reliability. The QUBE from C.R. Onsrud was developed for companies seeking 5-axis high-speed trimming and machining of advanced materials used in the aerospace, automotive, defense, marine, and pattern shop industries. This enclosed solution gives users a large work volume for machining molds, prototypes, and complex composite or thermoformed plastic parts while containing debris and isolating the operator from the machining zone and airborne particles. The machine design allows for various methods of work holding such as mechanical hold down and vacuum. Accommodation for oversized parts is achieved via removable side panels. Contact your Scarlett sales representative to see how this American made CNC can help improve your shop’s manufacturing. Increase Your Efficiency & Precision with this versatile tool that can be incorporated in any shop. The Weinig EasyStop is a linear positioning system that allows you complete flexibility while ensuring precision, power, and quickness. The EasyStop can position even the heaviest loads with unmatched accuracy reducing your handling costs and providing a safer and more efficient work environment. EasyStop is the new automatic length stop from Weinig. Used in combination with virtually any machine for cutting, drilling or milling of any material, the automatic length stop provides faster, more comfortable, and more precise processing. Cuthbertson, managing director of Weinig UK, says: “Careful measuring is necessary, but if you have an operator doing it regularly, it’s inefficient, slow and expensive in time and, when the measurements aren’t quite right, wasted material. 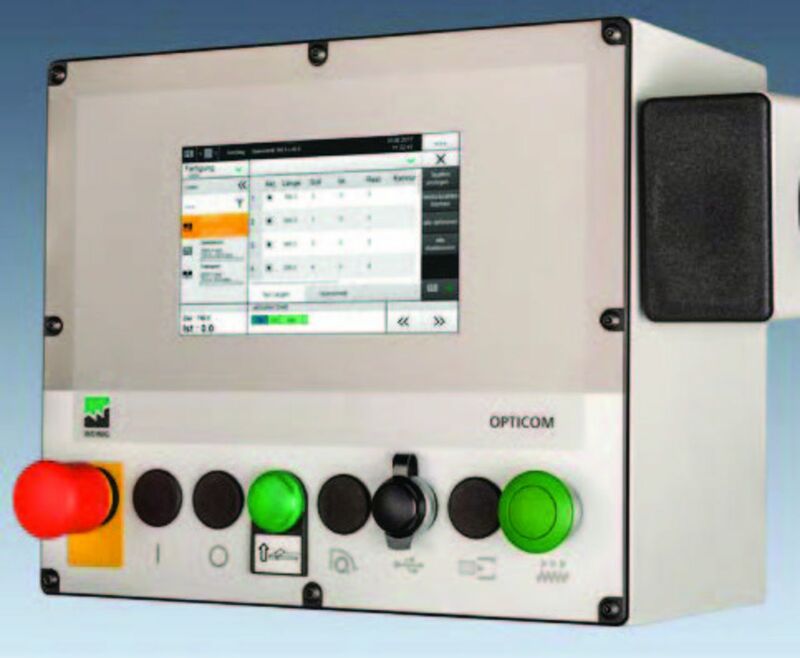 The OptiCom Assist user interface could not be simpler for set up or use. Absolute position of the positioning stop is actively monitored by the software and extreme loads are compensated by the integrated intelligent drive control – the hydraulic buffer means if the stop is knocked, the measurement will still be accurate. As the brains of the EasyStop, the OptiCom Assist user interface is intuitive and requires minimal training. Clear and easy to use, the interface guarantees efficient operation regardless of operating experience. With modes for both manual operation and list operation, the operator can set a desired length, or save 10 lists with 20 lengths each for fast processing of complete sets. EasyStop comes with its own stand and has options for roller tables. The EasyStop comes from the Weinig Group – the leading technology and machinery provider worldwide for the solid wood processing industry and artisan trades – and has the Weinig guarantee, support and service. The Stop System operating mode replaces one-off manual stop positioning. The workflow remains the same – enter the desired position, align the workpieces against the stop and machine the workpiece. The time-consuming activity of measuring and manually setting your stop is completely eliminated with this automatic positioning system. The Active Workpiece Transport mode aligns your workpiece quickly and accurately at various lengths taken from your cutlist. After defining your cutlist the EasyStop starts at a loading position and then transfers the workpiece to each desired cut without needing dimensional input from the operator. EasyStop compensates for the machining width of the cutting tool so your cuts are precise each time. So you would like to have a better idea of where your parts are? Has the job been completed? MillVision not only allows you to control what parts and jobs need to be cut, it allows you to manage the process. By posting a simple part list to MillVision, your operator will be able to view this list and begin the process without any paper, or manual entry that may inadvertently induce human error. Whether you have 5 EasyStops, or 1, MillVision allows shops like yours to create a complete workpiece flow across multiple machines and processes. For more information about the Easystop contact Scarlett Inc. today! 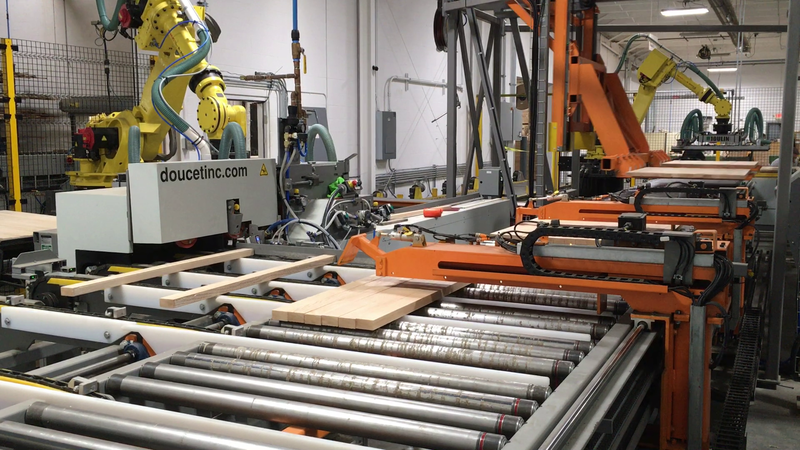 Said to improve production and reduce labor costs, Doucet Machineries’ ALYX is an automated loader system for high volume gluing application, panel preparation, and loading and unloading of the clamp carrier. The ALYX automatic loader is a 2018 IWF Challengers finalist. The company says the ALYX’s modular design allows it to be added to an existing clamp carrier or to be integrated in Doucet’s SRX hydraulic clamp carrier. Clamp carriers usually feature a rotating frame that clamps together glued panels allowing them to dry. The ALYX is divided into several sections starting with the lateral chain feeder, which receives the slats and guides each piece through to the next section, the glue application device. The glue applicator and measurement device is where the width of the slats are calculated ensuring that the last slat does not receive glue to create a dry joint in the panel. A dry joint is said to create air flow between panels and a building’s structural wall by allowing for expansion and contraction of the exterior panels. It also enables the inside air pressure to be matched to the pressure outside to resist wind driven rain and other factors that could drive water into the building’s walls. If rain does make it through, the dry joints allow the water to drain, evaporate, or dry. The slats are edge glued through an extruder instead of a glue roll which the company says will save 20 to 30 percent of glue. Much like a hot glue gun, an extruder pushes the glue out from a barrel onto the wood. A UV sensor follows the extruder to detect the UV additive in the glue and will emit a warning to the operator if no glue is detected. The panel forming zone is where all slats exiting the glue applicator are guided toward a transfer mechanism, which then side-shifts the slats against one another onto the panel accumulation conveyor until the panel reaches the desired width. This conveyor features two moving holders that move the completed panel to allow assembly of the second panel. While ensuring the panels maintain a fixed panel end, the holders move them along the accumulation conveyor toward the clamp carrier. 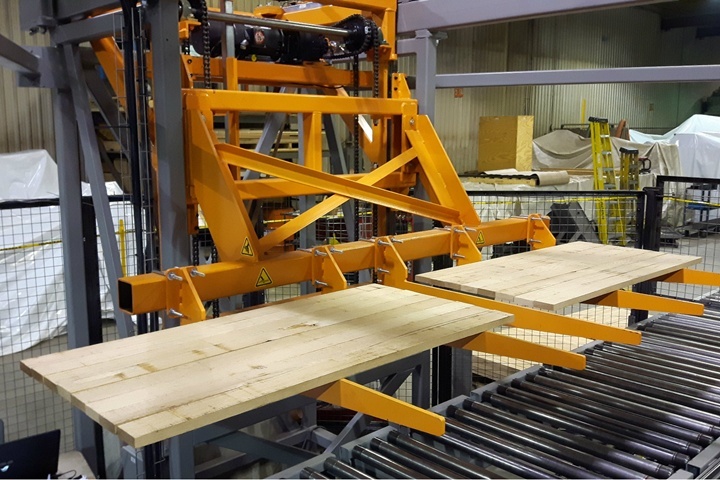 The arms of the two-axis automatic loader moves between the clamps of the carrier in order to load freshly glued panels into the clamps and unload dried panels onto the exit conveyor. Movement of the automatic loader is synchronized with the clamp carrier sequence so loading and unloading is done while the clamps are in a horizontal position. The final section is the motorized exit conveyor where the dry panels are removed from the loading area. If you have an application where this could be used, Contact Scarlett Inc. for more information. ALYX – Clamp Carrier Automatic Loader, We explained the regular process of edge gluing and its disadvantages. Today we reveal why you need the Automatic Loading system – ALYX. Dramatic Reduction in Labor: End users in the stairs industry have reduced their operation from 3 employees on one shift to one employee and 24 hour operation, increasing the quantity of stairs produced by over 40% with same labor costs involved and 30% glue savings. IMTS Will Provide You With New Manufacturing Technologies & Ideas! More than 115,000 industrial decision-makers, including many of your competitors, attend IMTS – The International Manufacturing Technology Show to get ideas and find answers to their manufacturing problems. They will see new technology demonstrated … and choose the best for their needs. At IMTS they find ways to cut costs and get more work. They know that to survive and succeed, they must keep up with technology … and stay ahead of their competitors! Everyone involved in manufacturing will benefit from experiencing the vast array of technologies available at IMTS. If you are going to IMTS this year and would like to meet us at the show, let us know. The International Woodworking Fair 2018 will be one of the top woodworking trade show in the world for the furniture manufacturing, architectural woodwork, custom and general woodworking industries. IWF 2016 marked the 3rd consecutive show that had growths in both exhibits and attendees with a total of 27,260 in attendance. This show hosted 1,079 Exhibitors and housed 532,565 net square feet of exhibit space. IWF 2018 will take place August 22-25, 2018 at the Georgia World Congress Center in Atlanta, GA. Contact us to schedule a time to meet us at a specific booth. – 18 HP Spindle – 4-Pole, 13.5Kw, 18HP – 24,000 RPM fully programmable & reversible, variable speed, HSK 63F tool interface, quick-change spindle, with air blast, capable of routing & drilling, programmable feed rates w/override capability. – 12Tool-DynamicAutomaticRotaryToolChanger-FullyServocontrolledinsteadof Stepper controlled or Rack-Style tool changers. Design eliminates misfires & quickly changes between 12 different tools – Able to Store Aggregates. You may require C-Axis or separate Aggregate Tool Changer option to hold some larger or non-standard aggregates. Q1 2018 is on pace to show the highest growth in the US economy since the Great Recession ended in 2009. Housing starts reached a 10 year high in November and a recent survey showed that confidence among home builders is at an 18-1/2 year high. The US economy is soaring and confidence continues to grow. 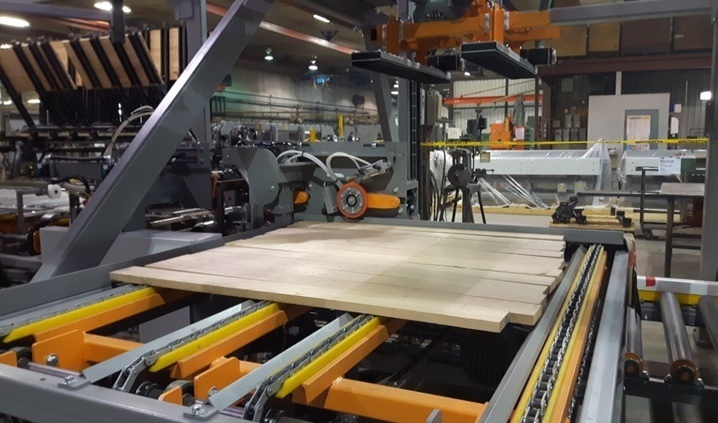 Now is the time to invest in technology that will increase your efficiency and throughput so you are able to meet the growing demand in the US for wood products. At the 2018 WEINIG/HOLZ-HER Technology Expo, you’ll see the latest in advanced wood processing technology. Come see more than 30 machines are connected to show the latest solid-wood and panel processing solutions available today. Come see EnVision Software – allows you to order your products and send them immediately to the manufacturing floor all at once. Come see the WEINIG Service App – on display to show our new “smart factory” capabilities. Don’t miss the chance to meet with our industry experts and learn how you can take your business to the level that will be required to keep up in 2018. Think Manufacturing. Think Advanced Wood Processing. Think WEINIG! Cresswood EF-24-40A ST Low RPM Grinder – NEW!